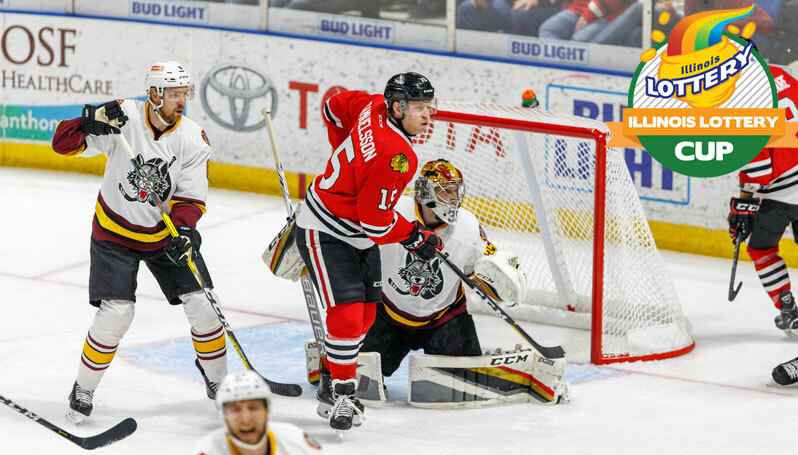 Rockford, Ill. – The Chicago Wolves rallied from a two-win deficit against the Rockford IceHogs to sweep a home-and-home set over the final two games of the season’s series and win their second straight Illinois Lottery Cup. Rockford went 6-4-0-0 prior to last weekend’s home-and-home set with the Wolves, and was just one win shy of securing their first Illinois Lottery Cup since the 2015-16 season. However, Chicago notched a 6-4 victory on Friday, April 13 at the BMO Harris Bank Center and tied the overall series in victories with a 5-4 come-from-behind win over the IceHogs in the series finale on Saturday, April 14. Saturday’s contest forced a tiebreaker with both Rockford and Chicago knotted at six wins apiece in the series, and with the Wolves owning 16 points (6-2-3-1 record) to the IceHogs’ 12 points (6-6-0-0 record), Chicago secured the 2017-18 Illinois Lottery Cup. Since the Illinois Lottery Cup series inception during 2011-12, the IceHogs and Wolves have each won three Cups. Rockford won the series in 2012-13 and 2014-16, while Chicago won the Cup in 2013-14 and 2016-18. The Lottery Cup is a competition between the American Hockey League teams that call the state of Illinois their home – the IceHogs and Wolves, adding an extra level of intensity to each matchup. The winner is determined by the most wins in the 12-game head-to-head series between the two teams. Originally, three teams existed in the series in the Chicago Wolves, Peoria Rivermen, and Rockford IceHogs. The Rivermen have since moved to the Southern Professional Hockey League (SPHL). The Wolves and IceHogs will continue their rivalry with a first-round matchup in the 2018 Calder Cup playoffs, beginning Saturday, April 22 in Rosemont. The Rockford IceHogs open up their home slate of the 2017-18 Calder Cup Playoffs with Game 2 (Ticket A) against the Chicago Wolves. Tickets can be purchased at IceHogs.com, by calling (815) 968-5222 or in-person at the BMO Harris Bank Center Box Office beginning Monday morning at 10 a.m.